Floresta Vermelha // Red Forest is the project of shooting a short movie with digital cinema resolution (2k) from original screenplay, soundtrack and art. And totally produced using free software and open hardware technology. Our aim is to contribute to the development of more customizable technology for digital cinema. You can help us in our quest, in exchange for exclusive material related to the film! Digital Cinema is a cheaper version of the film cinema. It records the same frame-to-frame way traditional cinema does, but instead of using film, it converts this information to bits and bytes (digital data). The images are captured in RAW format, allowing great range of manipulation in post production and enormous gains in relation to common full HD recording. Read more about digital cinema here. 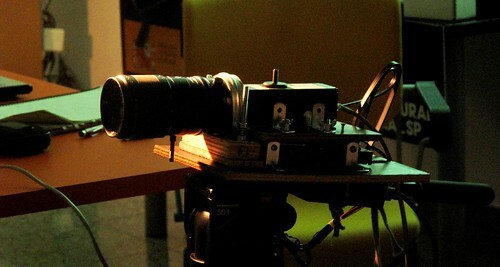 Great charm of our project comes from the camera: an Elphel 353. The Elphel cameras are most known for their use by Google Street View. This model can achieve resolutions up to 2592×1944 px, at 18 frames per second. For the movie, we will shoot in a 2k-equivalent resolution (2304×960 px), using standard cinema framerate (24 fps). Another interesting point is that the size of Elphel’s sensor is equivalent to a Super 8 film – so, in practice, we will be shooting a digital Super 8 mm film. Read more about Elphel´s cameras here. Our experimentation must be understood as part of our pioneering, for what we will do has not been done with these parameters in the world. There are short videos that have been recorded with Elphel, as there are excellent short animation movies that have been done with Blender, a free software. We want to continue in this same path, doing a short film with actors, dialogs, lights inside a location, telling a story that will be recorded with an open camera and edited – both video and audio – with free tools. To achieve that, we have done many tests to establish the real potential and limits of the Elphel camera, including a mini-short movie for field testing, which you can watch here and here. The Elphel cameras are all licensed as open hardware. This means they have their code and schematics open and accessible (GPL), so that anyone can consult or modify them. Even though they haven’t been made for cinema, an international community of developers and filmmakers has gathered under the name of Apertus (www.apertus.org) to research on how to do professional quality movies with them. The Elphel company has kindly lent us one of their models. In exchange, all the field knowledge generated by us, in special on editing and on automation processes (scripting), is being fully documented and released under GPL or Creative Commons licenses so that other people can use it for filming. Another strong issue when dealing with open technology is the collective intelligence behind the tools’ development. Everyone can collaborate in their improvement. More than that, being able to alter, adapt and transform them according to our needs make many processes infinitely more efficient when done in Linux. In other words, we will use the programming potential in our favor. Read more about the use of Elphel´s cameras for cinema here. Floresta Vermelha // Red Forest tells the coming back of young Nikolai to his parents’ house, in a village that could be anywhere in the world. There, he meets his mother, Liliya, and younger sister, Halyna, while waits for the arrival of his father, Yuriy, from work. Many things have changed since Nikolai left with most of the region inhabitants, some years ago. Others, in especial the relationship with his relatives, seems unaltered. Nikolai expects to be part of the family again by the end of the day. But what does “being accepted” mean in a place where the forest shines red in the dark? In October, 2010, we finished the short movie screenplay. We knew how we wanted it to be recorded and the limitations our camera would impose to us. The story took all that into consideration. The mood is of a suspense movie – not a horror suspense, but one in which the storyline is build little by little. This approach necessarily opens room for the art and the actors. In a general way, this is the first time of everyone – it is the first time the director directs a movie; it is the first time the photographer photographs for cinema; it is the first effective art direction of the art director and so on. More than being a defect or weakness, this makes us way more partners and strengths us as a group. Also, everyone has solid works in her/his area, making us confident in the final result. Read more about our team here. There is a common-place that says it is expensive to do cinema. We aren’t here to prove otherwise. We must have scene objects, adequate lightning equipment, to transport everything, to improve the locations, to feed everyone after an extensive day’s work. We are covering these costs in two fronts: by offering workshops related to our project or to the free/open tools we use; and via this crowdfunding campaign. Your participation is essential for us to make a nice movie! Everyone in the team, with the exception of some people that will do the more physical work of preparing the location, are here as voluntary collaborators. This means they are working without being paid because they believe the process and the results will be interesting. And in order to achieve an interesting result, we will not concede on doing a beautiful movie, one we will be proud of. The money raised here with your support will all be used to improve production. We have millions of ideas and things we would like to do that would make the movie even more interesting that are, at the moment, financially impractical. Better lightning, extra location, makeup and hairstyle, scene objects… many small details that we’d like to add and that will certainly make all the difference in the final result. The main objective of the Floresta Vermelha // Red Forest movie is to prove, with results, that it is possible to do a professional cinema production with the use of open/free tools. But our ambitions don’t stop there. We are also having a good time – our crew is very diverse and only a few (about 4 people) will deal with the most technological part of the film – putting us way closer to the International Movie Festival than from Campus Party. Part of the fun is the release party, scheduled for November the 30th, 2012, in São Paulo (Brazil). We are planning a very nice event in which we will exhibit the movie and the band Mamma Cadela will perform the original soundtrack live. We also want to participate in other festivals and take it to other institutions. The internet is the natural place for the final cut, published under a permissive Creative Commons license – we just need to analyse when will be the best moment in 2013 to do that. Know more about our project in our production blog and follow all the process in our page at Facebook. If you have other doubts and comments, please write us. We’ll be very glad to answer you!